A condensate secondary pan for a central air conditioning system is herein disclosed whereby overflow protection of the primary condensate removal system for a fan coil unit of a central air conditioning system is realized. The secondary pan is positioned directly beneath the primary pan of the central air conditioning system to convey condensate safely outside an enclosure should the primary pan overflow due to clogging of the primary drain line, or leak due to cracks or fissures formed in the primary pan. The condensate secondary pan has a predetermined girth sufficient to extend laterally beyond the primary pan of a conventional fan coil unit. The condensate secondary pan also has a bottom panel which is frustoconical in shape, thus minimizing the pooling of condensate on its surface as well as an integral drain pipe connecting means, thereby eliminating the need for a superfluous user supplied connecting means which is typically made of metal and thus is susceptible to corrosion. I wish to explore opportunities for either licensing or sale of this patent. Roughly, a minimum of 1 million homes are constructed in the US requiring this code required secondary pan that is currently made from metal and a flat-bottom panel. The standard sized unit costs approximately a min. of $75 to as much as $250 per unit. That said I am desiring to corner the market by also modifying slightly the IRC codes which if accepted would divert installers to my product versus what has been going on. A fantastic opportunity. My current job is in the Real Estate arena not HVAC but because I have owned three units in my house alone this product was incredible. I just do not have the expertise nor knowledge to market sell and distribute this to the market. 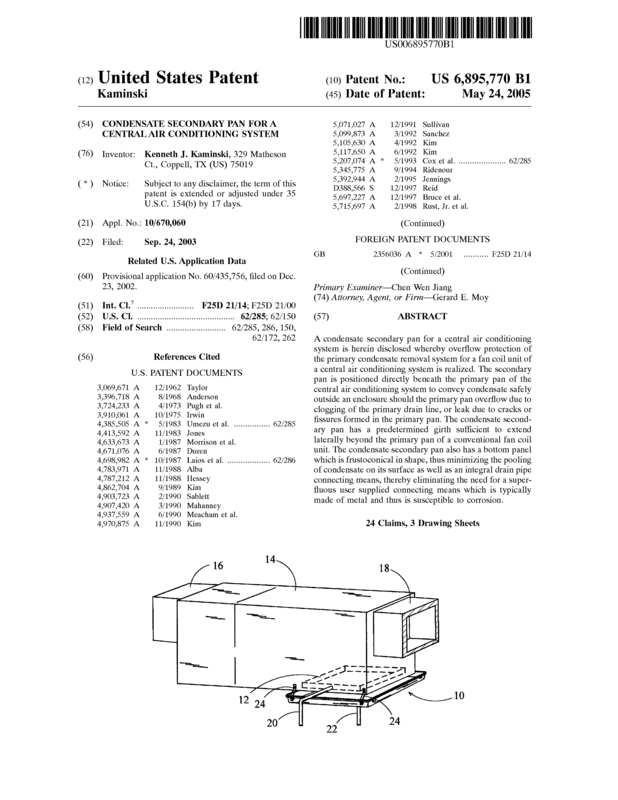 Page created at 2019-04-25 19:59:36, Patent Auction Time.